Willie O’Ree, who was inducted into the Hockey Hall of Fame in November, will be the subject of documentary about the first black player in the NHL. The movie, “Willie,” will be released in 2019. The feature-length film will follow O’Ree’s journey to the Hockey Hall of Fame, including looking back at how his family escaped slavery in 1779 and settled in New Brunswick, New Jersey where, generations later, O’Ree grew up and learned to play hockey. 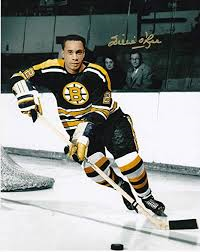 O’Ree, now 83, broke the NHL’s color barrier when he played for the Boston Bruins against the Montreal Canadiens on Jan. 18, 1958. O’Ree paved the way for generations of black athletes to play hockey professionally and he has become a spokesperson for the NHL since returning to hockey with the NHL/USA Hockey Diversity Task Force, now known as Hockey is for Everyone. O’Ree was inducted into the Hall of Fame as a builder. It features interviews with Wayne Gretzky, Wayne Simmonds, Devante Smith-Pelly and Prime Minister Justin Trudeau, among others, who talk about how O’Ree’s historic NHL debut 60+plus years ago changed the game forever. Click here for the movie trailer. BendBroadband recently launched the NHL Network on channel 45 (SD) and 645 (HD) in its Preferred package. Each season, the NHL Network broadcasts up to 80 regular season games six days a week. The network also broadcasts live NCAA college hockey games, which air Friday nights during the season. Customers interested in learning how to add the Preferred Package, or any specialty tier, to your programming package should call 1-541-803-8087.